White against brown – a ropy camouflage mechanism. We currently seem to have a foot in both camps; this is an odd middle-ground between autumn and outright winter. The leaves are off the trees but the grass is still growing. We’ve had two frosts, but both have been burnt off before seven o’clock in the morning. It was possible to head out to the hill for a day’s stalking last week in just a shirt and pullover, but as I found last night flighting wigeon, the dusks now belong to the winter woodcock. Invited to shoot in Aberdeenshire earlier in the week, the grouse were neither in packs nor pairs, but more often in small groups of three and six. They were as wild and as jumpy as late season birds, but there was none of the massing gangs we often associate with the end of November. Behind the scenes they have begun to move en masse in secretive ways, but to a day-tripper like me, it would have been easy to imagine that these were the birds of a month ago. 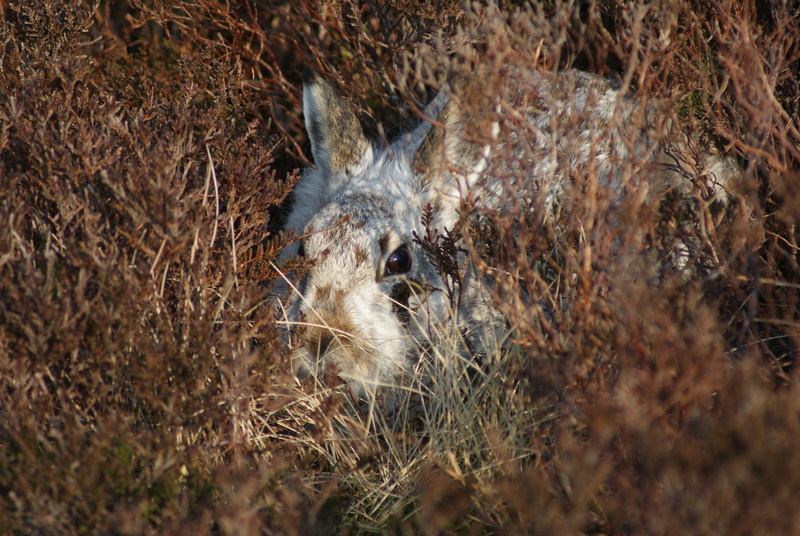 Walking in line, white hares leaped out of the dark heather at my feet like absurd teddy bears, as garish and conspicuous as a cuddly toy that you might win at a fairground. Some of these hares made for exciting shooting, particularly as they ducked and weaved between the haggs and over the dead grass. Great gouts of white floss sprayed off them as they were brought somersaulting to a halt, and each one was worth the carrying in anticipation of that dark, fantastic meat. Dozens rose up or doubled back unmolested, and on some of the higher ground they scattered through the peat in disparate gangs of twenty and more. How they must have sweated to bolt and sprint in their heavy winter coats while we walked after them in shirtsleeves. And waiting for ducks by the splash of water last night, I saw mild-summer bats flickering among the woodcock in the half dark, stooping down to sip droplets of water from the reflected sky. The first two wigeon came down with a plop, and as the dog puffed out to pick them, I folded up the gun sleeve and fell back from the lip of the water. Rather than take them as they came, I didn’t want to unduly rock the boat on this promising dub, and preferred to wait and see what came in from behind a bank of darkly flowering whin. For all that there is a huge market for American “duck-hunting” camouflage, there has never been a technological improvement on the simple art of standing still. Over the next quarter of an hour, more than thirty wigeon came slashing in a few feet over my head as I stood in plain sight against the undergrowth. They landed on the water with a saucy plop and commenced to growl and squeak like bossy little tyrants. I came away when the filmy surface was creased and wrinkled with the self-important whirr of clock-work paddles and strolled back down to the house with the dripping dog. Once in the light, I saw that the ducks in my hand were still moulting out of their eclipse plumage. Early in the season it is not uncommon to find a few barred brown feathers here and there on necks and rumps, but one of the birds in particular was thickly marked with rusty reds and caramel browns where I would usually expect to see pristine pinstripe grey. It would be foolhardy to gauge the passage of the year by the date alone, but until this mildness breaks into real cold, it is easy to imagine that autumn is stuck like a scratched record. More than just a dyke ornament – some odd behaviour on display. 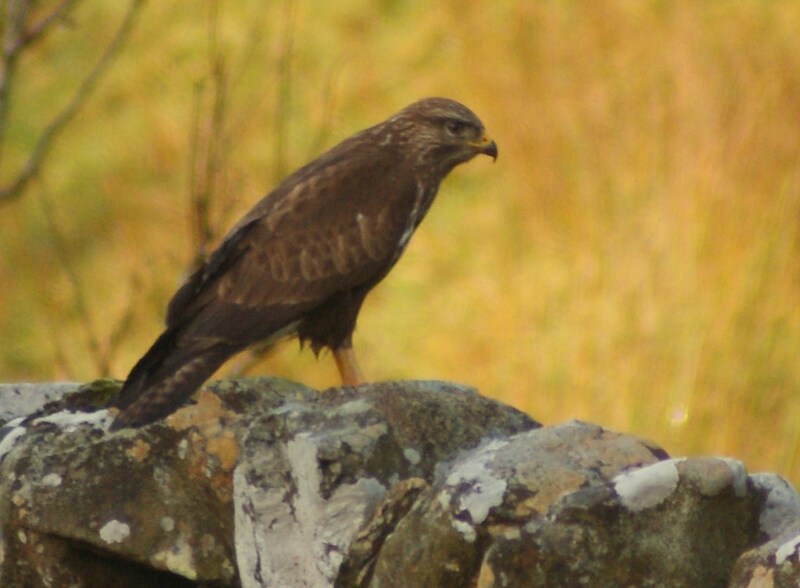 Also worth recording in brief some bizzare buzzard behaviour noted on the walk back off the hill last night. The sun was long below the horizon and the first woodcock were beginning to flight from the willows around the house as I watched a buzzard drop down out of a scots pine and sit on the dyke which made a saw-toothed black horizon to the North. I had taken ten minutes to see where the crows were going to roost and was a second away from standing up and walking back to the car (having discovered their sordid billet in a thicket of rowan) when the buzzard dropped over me, and I paused to see if I could find out why he hadn’t gone to roost. With a silent flick, the dark shape dropped off the dyke and began to coast over the long grass precisely like an owl. There was hardly any flapping, and when the wingbeats came, they were soft and shallow. I stood up as it flew out of sight, then watched it come back and ever closer. I had been certain that I was looking at a buzzard, but there was something so owl-like about this shape that I suddenly thought that I must have been mistaken. Surely it was a long eared owl, of which there are several on the farm at the moment. I put up my binoculars to get a clearer picture in the gloom, and still the shape came nearer in total silence. It was concentrating so hard on the ground just below it that it never saw me, so that when it did it flared up noisily and gave no room for confusion. It was certainly a buzzard, but it was copying the owl’s trick of slow, low, silent hunting just on the blue dusk. Perhaps it had learnt to hunt like this after a summer of phenomenal vole numbers, or maybe it had seen owls hunting and literally borrowed the technique. Whatever the explanation, it was evidence of the fact that buzzards are extremely adaptable animals, and the old lie that they are “too lazy” to do anything more than pick at carrion and worms is wholly defunct. This bird had learnt a trick just like the birds I described killing snakes in previous years and was simply trying its luck with a unique skill. It is a horrible generalisation to think that bird behaviour is the same across entire species, and intelligent individuals are always trying new things otherwise they would simply die out. I was told that I was a liar when I said I’d seen a buzzard killing an adult greyhen because “buzzards don’t do that”, but it is absurdly naive to suggest that a predator would not capitalise on an opportunity to kill for the sake of upholding its reputation among human beings. A fox of significant antiquity. 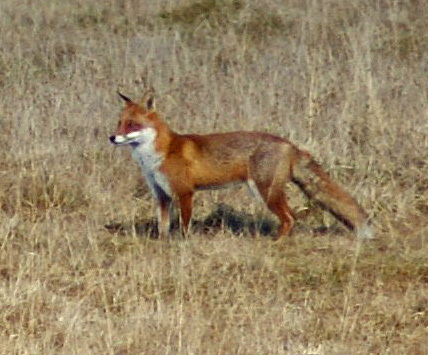 As a post-script to a blog written in September about a mousing fox on the Chayne, it is worth recording that he was brought to book shortly before sunset last night after a stalk that took in three quarters of a mile of hillside so open that crawling was the only means of approach. By the time I got into him, my glasses were cloudy with condensation, I was wet from my ankles to my collar and every muscle was at a fever pitch of cramp after having hidden in a peat hagg in the most awkward position imaginable while I waited for him to drop over the horizon. He had sat down as if he knew that I was waiting for him to move. When the shot came, he ran forty yards and somersaulted to an abrupt end, despite the little .222 round having punched him precisely in the right place. And what wonderful condition he was in after a summer of mice and voles on the open hill. I was surprised to find that he must have been a fox of significant antiquity, since his muzzle was white and flecked with scars and the tip of his left ear was tagged with a deep and long-healed rip. More surprising still was the fact that he only had two front teeth – the bottom left canine and the top right canine. The top gum had healed to leave an ugly scar, but the bottom was such an old wound that there was no sign that it had ever been there. His left nostril was scored open, and the impression overall was that I had felled the grand old meister. As I sat and watched the sun go down, I wondered how many blackgame poults he had eaten during his tenure and tried to guess how quickly his empty territory would be filled again by an equally ravenous newcomer. I must keep an eye on this side of the hill. An Aberdeenshire bird “en passant”. 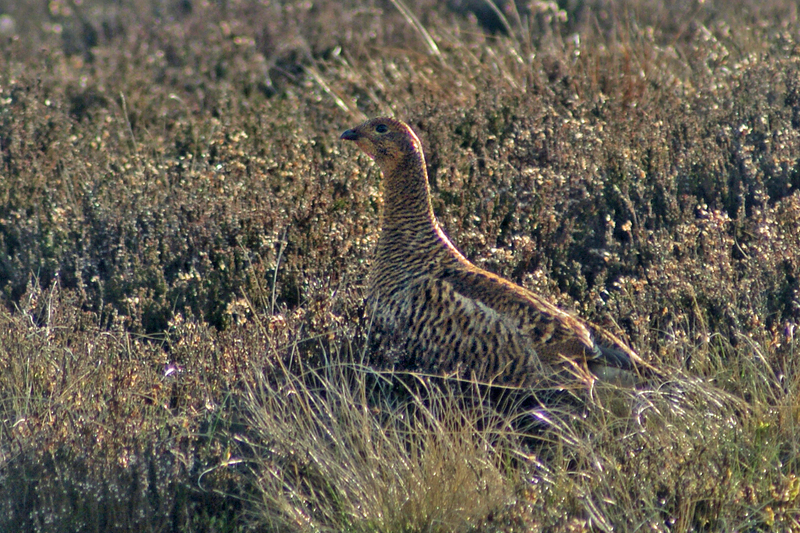 Just in passing, it was worth posting this picture of a greyhen from near Fettercairn taken last spring. It turned up during a search on my laptop for something else, and rather than let it vanish again into the doldrums of my hard-drive, I thought it was worth an airing. Worth mentioning in brief that after a few weeks without seeing any blackgame on the Chayne, I was pleasantly surprised to have a thrilling reunion last night when walking in off the hill just on the darkening. I looked up in the blue gloom and there was a blackcock blasting downhill just twenty feet over my head. I could hear the wind whistling through his feathers as he came, and it would have been quite easy to mistake him for a mallard if it wasn’t for the floppy tail and the supercilious angle of the head. He vanished down over the red grass towards a seventy acre bog which is probably the least visited part of the entire farm. I had always dismissed this area as barren and hopeless, since the only things I have ever seen down there have been voles and crows, but since some adjacent forestry has been felled the aspect is now altogether more welcoming. One of the summer broods was found a little further West of this mossy hole, and it could be that I ought to be focusing my attentions in that direction. It was interesting to see that he was flighting at about the same time as the woodcock, and two or three long-beaked shapes came whizzing crazily past a few minutes later. Perhaps this is a habit he has copied from them, since they stand to lose a great deal by undertaking long flights in the open while hawks and falcons are out and about. This short period of twilight is a busy moment for all kinds of shy, vulnerable species, and perhaps the blackcock knows that. It was also a good reminder of the scale of ground that blackcock use on their daily rounds. Judging from the angle he was flying at, he had got up from a piece of rushy ground on the neighbour’s back hill, and by the time he landed, he would have covered more than a mile. That is a tiny distance for blackgame, and it puts my 1,600 acres in perspective as part of a much larger landscape for these birds. One of the many youngsters who made it. 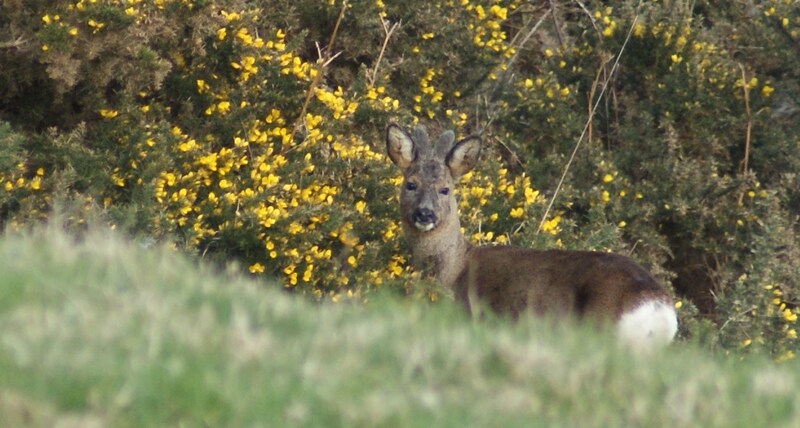 As part of my work to improve the farm for the sake of black grouse, I have been really encouraged by the way that the roe deer have responded. Within two or three years of removing stock from a piece of ground, roe simply move in and make the space their own. I was always told that roe will not share ground with sheep, and it has been pleasing to note that this is generally true. It’s not that the two make mutually exclusive inroads into the local food supply, but the roe actively seem to dislike sheep and take pains to avoid them. The only time I have seen roe with sheep, the latter have been stocked so lightly that any fussiness by the former would have seemed absurdly fastidious as if it were a point of principle. I have three little “woods” on the go, as well as a long strip of sitka spruce which attracted the first roe within hours of my opening it up and cutting it in half with a sheltered ride. At the time, I was amazed by the way that these deer seemed to fall from the sky, but having bumped them often enough with the lamp and caught them out in the open at first light, it seems that they generally roam around the farm at will under cover of darkness, and large open spaces which seem deeply inhospitable by day become practicable for prospecting deer under the stars. Now that some of the young trees are starting to approach my head-height, the woods seem to attract deer as if they were stepping stones between the vast banks of commercial woodland. The birches and rowans are spilling over the tops of their guards, and the un-grazed vegetation at ground level comes alive with colour during the summer, when king cups, ragged robin, flag iris, speedwell and milkwort light up the grass. One of these little woods is only around a quarter of an acre, having been formed by a temporary fence between the dykes which was strung up to make a secure triangle of ground for difficult ewes during the lambing. I planted up this little patch on two sides with a hawthorn hedge and filled the centre with an odd mixture of rowans, birches and aspens. A friend gave me a sack of scots pines, and these were also planted despite the ground being rather too wet. Over the past four years, the trees have done really well, and it is a constant source of delight to take a wander through the emerging thicket. When I went up to visit this little wood yesterday, it looked very different. The grass was all trampled and the trees had obviously been hammered. The scots pines were just bumpy pegs without a single needle, and the flag irises were reduced to fibrous stumps. Despite my best efforts, it seemed that the sheep had been able to penetrate this little sanctuary, and I walked around the dyke to find out how they had got in. I was surprised to find that there was no clear point of access, and felt slightly confused by the obvious trampling which ran back and forth up the inside of the small temporary fence. It had been so excessively trodden that it looked like a mountain bike track in the Peak District, and it seemed like something had been trying desperately to get out. And then the picture became clear. A small hut was built out of pallets when the fence was first erected so that the lambing ewes could have some shelter. In the dry grass under the corrugated iron roof, there was a little deer. It had been dead for less than a week, and as I picked it up, I realised that it was as light as a feather. The bones stuck out on its hips and its ribs felt like pencils. It had clearly been stuck in this little wood and had eaten everything it could as the temperature started to drop and the grass stopped growing. It was impossible to tell how long it had been in there, but my notes inform me that I was last in the wood in July, and there was no sign of any browsing then. Could it have been born in there this summer and was able to walk within inches of it without ever seeing it? If it had been born in there, the doe could easily get over the fence to feed her youngster, and it could have grown up in this quarter acre prison until the milk had dried up and the food had run out. Surely it did not jump in and then couldn’t jump out? And regardless of how it got in, why on earth didn’t it jump out? Parts of this ramshackle barrier are so low that I can step across it without even having to hold the top barb down, but as the tracks revealed, the little deer had walked back and forth along that boundary as if it were the Berlin wall. I describe it as a “little” deer partly out of pity, but I have certainly seen smaller deer jump higher obstacles. It was a horrible discovery, and I have been feeling strangely guilty about it. I know that I shouldn’t feel bad because it was hardly my fault, but I had accidentally built a roe trap and it must have been a harrowing and lonely end for its victim. There is no comparison between this sinister, lingering decline and an abrupt, careful death administered by a rifle shot – I have no qualms with death in itself, but the nature of this incident was protracted, unpleasant and amounted to little more than a sad waste. There is no way I could have predicted that this would happen, but I still feel implicated. Indeed, it raises the question of how many fawns die like this each year in quiet, avoidable corners where nobody ever finds them. Most striking of all is the idea that roe have something of a tragic aura about them. They are unquestionably the most beautiful mammals we have in this country, with a wealth of fascinating behaviour encompassing everything from affection and delicacy to savagery and strength. But so often, the only way we humans ever encounter them is in their moments of misery and death. Their swollen corpses litter the roadsides and their young are minced by silage cutters or fatally abducted by idle well-wishers who think they can help. Roe probably don’t suffer worse privation than any other British mammal, but their moments of delight and comfort are so often hidden from our eyes that we seldom see anything to counter their abundant, conspicuous suffering. To us, the balance seems to be perpetually tipped towards doom. 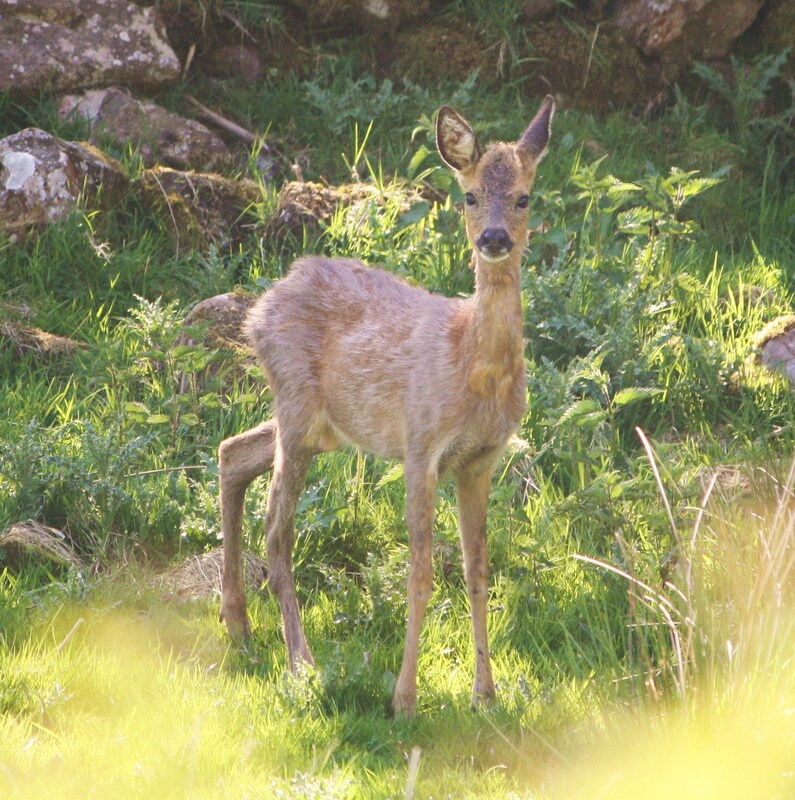 If that little fawn had got out of the wood and vanished into the hills with its mother, I would never have known that it had even existed. The huge majority of fawns born in 2014 have melted into the long grass to lead full, satisfying lives in total secrecy, away from the vulgarity of human observation. But having been blind to the success of the many, I find myself dwelling on the gloom of this sad individual. In the certain knowledge that any discussion based on rifle calibres will be subject to laborious and self-righteous analysis, suffice it to say that change has blown in on the wind since July this year. Having shot several bucks with a .222 during the summer, I can well understand why these light 50gr rounds are deemed the absolute minimum for deer, and several shots taken at less than seventy yards failed to produce exit wounds. The lead was more often than not lying just under the skin on the far side of the beast, and while sufficient damage had been wreaked on the internal organs, I always had the feeling that I was operating on a fine line without much of a margin for error. The final straw was on Saturday, when I hit a doe fractionally too far back across the bottom of the lungs and had to fire a second shot as she took a few steps, stamped her foot and stared back at me in confusion. Fortunately the second did the job that the first should have done, and she tottered for a moment before tumbling into the heather, but during that brief moment, my heart was in my mouth. The .222 has been the star of the show over the past four years since I downsized from a .243, and it has dealt with dozens foxes and plenty of roe. I will certainly keep this little rifle, since it clearly has its place, but I would prefer something with a bit more oomph. I am fortunate enough to have some very supportive stalking friends, and one in particular has been incredibly helpful in recent years. Whenever I come across something deer related I don’t understand, I mentally log it as something to ask him the next time I see him, and I am seldom disappointed by his encyclopedic knowledge, particularly of roe. This stalking oracle shoots all of his roe (and red (and boar)) with a .308, and I have been really impressed with the relative lack of damage caused by the heavier calibre. The light .222 round travels so quickly and breaks up so readily that the fore-end of the deer is often a write-off if the lead touches the bone, but the .308 plugs a momentous, show-stopping hole and then goes about its business. I was very impressed with the calibre when I used it stalking hinds with a friend in Aberdeenshire last year, and was further encouraged during a day with WMS firearms training in Ceredigion in August, when I was shooting targets out to 900 yards under the watchful eye of Andrew Venables. The versatility of the round shines through, and the fact that it can be used on anything I’m likely to find in Britain (and Europe, and certainly most of Africa) is a real bonus. The heavy bullets drop very quickly, but I’m not a long-range enthusiast and most of my shooting takes place well within 200 yards. I’d like it as a “deer rifle”, and while most of my stalking is with roe, reds crop up every now and again and I have a growing ambition to learn more about sika. There are wild boar on some of the ground I stalk, but having been spoilt with the savage, adrenaline-soaked thrill of driven pigs in Croatia a few years ago, the prospect of sitting out for them over a stack of maize doesn’t really set my world alight. There are all kinds of alternatives available in the world of rifles, and debating which calibre is “best” is one of the armchair sportsman’s greatest hobbies. If you spend too much time listening to half of the rubbish talked about rifles then you’d never be happy with any decision, so having taken what I regard to be sound advice, I am taking the plunge and applied for a variation for a .308 earlier in the week. I know what manufacturer and model I want, and this blog will record my progress in due course.